Harish Sukumar is a consulting executive with extensive leadership experience in Life Sciences and Healthcare. His experience includes delivering solutions for Pharmaceutical, Biotech, Medical Device companies and Payers across North America. His functional focus areas include Commercial Effectiveness, Clinical Trials, Competitive Intelligence and Compliance for Life Sciences companies as well as Member Analytics, Risk Estimation and Customer Service Optimization for Payers. Harish’s technology focus area includes data and analytics, CRM, digital transformation, omnichannel and IT strategy. Prior to joining Trexin, Harish’s experience spans 24 years in various consulting firms like Capgemini, IBM, PricewaterhouseCoopers, Ness Technologies and Clarity Solution Group where he held leadership roles. 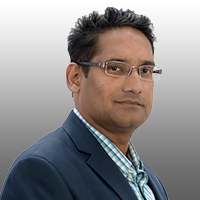 In the role of CTO for Life Sciences at Trexin, Harish helps Clients achieve business value through the use of technology and data, developing and executing IT strategies to drive profitable growth, optimize costs, reduce risk and achieve compliance.